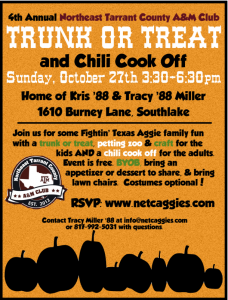 Join us for our 4th annual Trunk or Treat and Chili Cook Off. It is an evening of family fun. Chili for the adults. Hot dogs and Candy for the kids. Prizes awarded for People’s Choice Best Chili and People’s Choice Best Decorated Trunk!